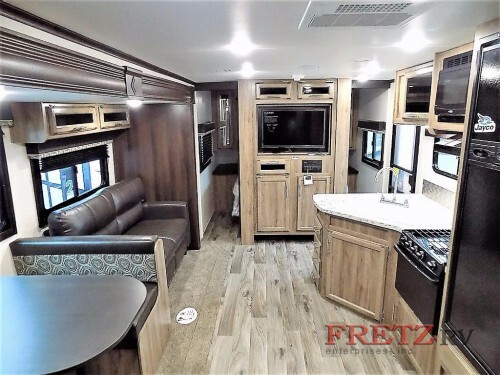 The Jayco Jay Feather travel trailers for sale here at Fretz RV Enterprises bring comfort and convenience to the RVing world, and with nine floorplans available, there is certain to be a model ideal for your family. Each option will come with one slide, but with sleeping spaces ranging anywhere from four to ten people, you can choose between room for more amenities or more people. 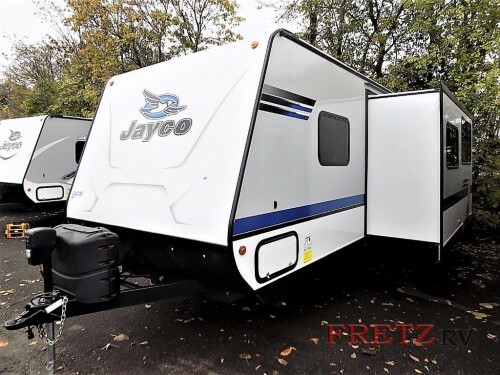 Let’s check out everything you can enjoy in this Jayco Jay Feather travel trailer review! Travel anywhere with ease in our Jayco Jay Feather Travel Trailers! At first glance, the Jay Jay Feather has a fun and unique exterior that everyone is sure to love. The rounded front profile and modern retro graphics give it a nostalgic and beautiful look. However, this design does more than just make it look good, but it also makes it more aerodynamic and able to cut through the wind while towing it. This plus the ultra lightweight construction make for one of the easiest to tow RVs on the market, so getting to and from the RV park will be easier. With bunk bed and bunkhouse floorplans, you can find options for the whole family. 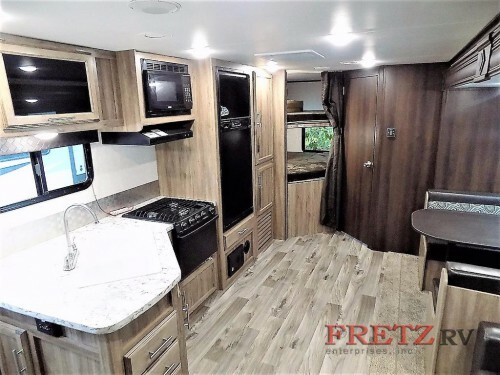 As we have already pointed out, the Jay Feather travel trailer can house as many as ten people depending on the floorplan you desire, and the way it does this is by offering bunkhouse floorplans. Choose among a set of single bunks, double bunks, or a completely separate bunkhouse, and give the kids in your group the perfect space. These areas as well options featuring a queen master bed, convertible living room furniture, or a Murphy bed will make room for everyone. Spacious interiors make room for all the comforts of home. These campers come with everything you need for the perfect stay at the campground. Inside you will find plenty of seating spaces, a full kitchen complete with Norcold fridge, full bathroom, and an entertainment area. But the comforts do not stop inside! The standard Customer Value Package will provide you with more ways to enjoy the great outdoors including a power awning with LED lights and exterior TV bracket and cable hookup for the perfect exterior entertainment space. With the beautifully, unique exterior and more features to love, our Jayco Jay Feather travel trailers are certain to check off all of your needs. To find out more, be sure to contact us or stop by our location today!